You can schedule and hold meetings using the AT&T Collaborate – Meetings app, which is fully integrated with the Collaborate app on all platforms. Click Schedule. The Schedule a new meeting window opens. In the Topic field, enter a name to identify the meeting (optional). If you don’t enter a name, the meeting name defaults to [User Name’s] AT&T Collaborate Meeting. For Host, select On to have the host video automatically on when the meeting starts. For Participants, select On to have the participants’ video automatically on when the meeting starts. To limit attendees to calling in by phone, select Telephone Only. To limit attendees to using their device audio only, select Computer audio Only. To allow attendees to call in or use their device audio, select Both. Check Require meeting password, and then enter a required password for the meeting (optional). – Check Enable join before host to allow attendees to join the meeting before the host joins. – Check Mute participants on entry to start attendees on mute when they join. – Check Use Personal Meeting ID to use your personal ID to identify the meeting. Otherwise, Collaborate – Meetings will generate an ID for the meeting. – Check Record the meeting automatically to record the meeting, and then select Locally or In the cloud to indicate where to save the recorded meeting. – In the Alternative hosts field, enter the email address for attendees who will also have host privileges for the meeting. Select Outlook to schedule the meeting in Microsoft Outlook. Select Google Calendar to schedule the meeting in Google Calendar. Select Other Calendars to get text for an invite that you can copy to the clipboard and paste into another scheduling application. Click Schedule. Depending on the calendar option you selected, the meeting invitation will open in Outlook or Google Calendar or a window will open with the text to copy. Add invitees in the calendar application you’re using. For more information, go to Invite attendees to a meeting. Tap Schedule. The Schedule Meeting window opens. In the Schedule Meeting window, enter a name to identify the meeting (optional). If you don’t enter a name, the meeting name defaults to [User Name’s] AT&T Collaborate Meeting. Starts sets the starting day and time. Duration sets the duration of the meeting. Time zone sets the time zone for the meeting host. Repeat sets whether the meeting will repeat daily, weekly, bi-weekly, monthly, or annually. End Repeat sets the end date and time for a repeating meeting. This field only appears if the meeting has been set to repeat. 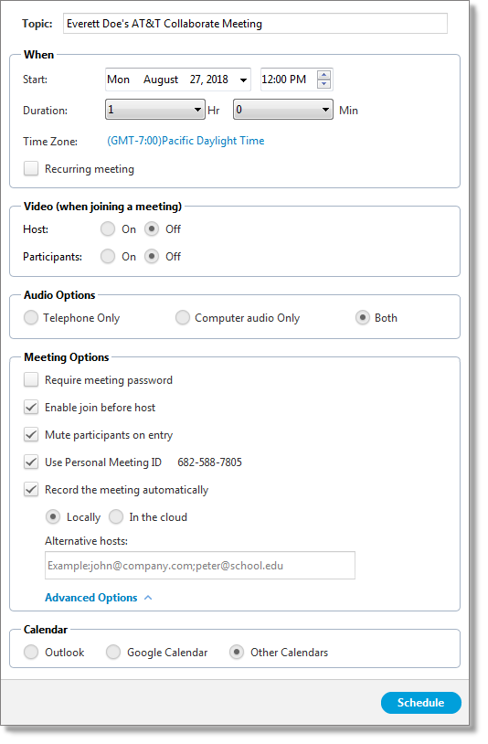 Use personal meeting ID sets whether to use the host’s personal ID for the meeting. 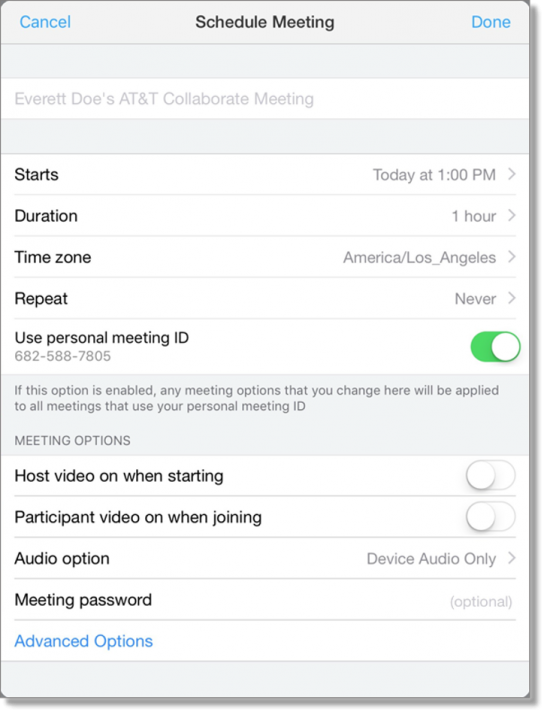 Otherwise, AT&T Collaborate – Meetings generates a meeting ID. Turn on Host video on when starting to automatically enable the host’s video when the meeting starts. Turn on Participant video on when joining to automatically enable participants’ video when they join. – Telephone Only to limit attendees to calling in by phone. – Device audio Only to limit attendees to using their device audio only. – Telephone and device audio to allow attendees to call in or use their device audio. Tap Meeting password, and then enter a required password for the meeting (optional). – To allow attendees to join the meeting before the host join, turn on Allow join before host. 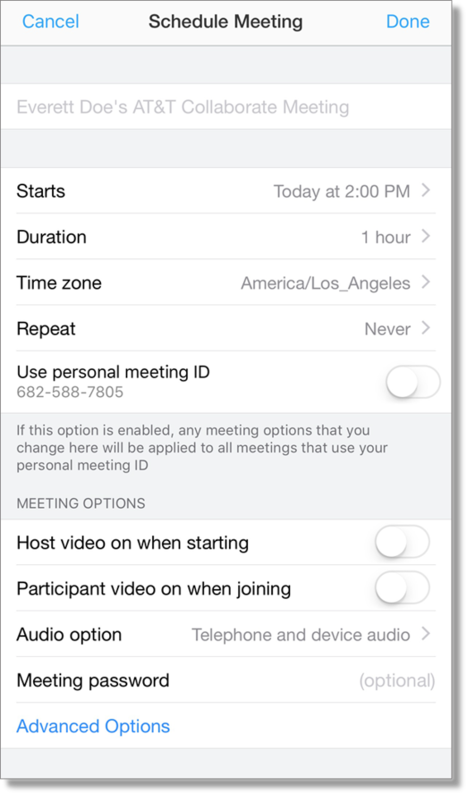 – To record the meeting, turn on Record meeting automatically, and then tap in Record location and select Local computer or In the cloud. – Tap Alternative hosts, and then enter the email address for attendees who will also have host privileges for the meeting. In the upper right of the window, click Done. The New Event window opens showing the meeting details. In the upper right of the New Event window, click Add. For information about adding invitees to the meeting, go to Invite attendees to a meeting. In the AT&T Collaborate – Meetings app, tap Schedule. The Schedule Meeting window opens. – Turn on Allow join before host to allow attendees to join the meeting before the host joins. – Turn on Record meeting automatically to record the meeting, and then tap in Record location and select Local computer or In the cloud.